A thrilling non-stop adventure! 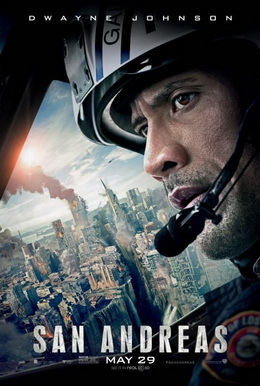 If you’re looking for a disaster movie that will have you on the edge of your seat the entire time, then check out Warner Bros., Village Roadshow, and New Line Cinema’s San Andreas starring Dwayne “The Rock” Johnson. Despite having a one-dimensional plot and completely unbelievable scenarios, this movie will keep you entertained for the entire runtime. Spend your time with a ripped helicopter pilot who’s the poster child for a ‘Jack of all trades’ and his beautiful daughter who could out Eagle Scout an Eagle Scout. No dynamic love story here–just extremely high energy, larger than life, visceral complete and utter disaster around every corner. This movie definitely doesn’t do anything to help the realtors and architects in L.A. and San Fran. If you liked the original Earthquake, Volcano, The Day After Tomorrow, and The Core, then you will most likely enjoy this film. Or, if you were the kind of kid who would build cities out of Legos then have enormous fun destroying them, then this is definitely for you. San Andreas is about a magnitude 9.7 earthquake affecting the famed San Andreas fault line in California. Form the Hoover Dam to China Town, the extremely destructive earthquake reeks havoc in its very wake. Follow Ray (Johnson) as he and his soon-to-be-ex wife Emma (Carla Gugino) unexpectedly team up to save their daughter Blake (Alexandra Deddario) from becoming the next victim to the record-breaking earthquake. Witness the utter destruction and peril that Ray and Emma have to overcome on their way from Los Angeles to San Francisco. Banning together to survive the earthquake, Blake and brothers Ben (Hugo Johnstone-Burt) and Ollie (Art Parkinson) must get to higher ground in order to be rescued by Ray and Emma. Like with many over-the-top disaster movies, this one really doesn’t offer that much to critique. Of course the plot could be completely picked apart–very easily–but the thing about these movies is that they are produced for pure entertainment value. The writers and director are hoping that you don’t spend too much time thinking about the sheer impossibility or unlikelihood of Ray and Emma finding the aircrafts and watercraft they do. Or, why the city of L.A. would allow one helicopter pilot to use municipal gas and a helicopter to rescue his immediate family, meanwhile, basically abandoning all other citizens to peril. You see, it doesn’t take a film critic or scholar to notice the absurd plot devices and failed logic. That being said, this film was very entertaining to watch and follows good visual storytelling structure. You have order (very briefly), followed by disorder (most of the movie), and the circle back to order once again. Oh yeah, there is a brilliant seismologist professor and media team at Cal-Tech (California Institute of Technology) who are basically there when the director needs something else to cut to. Otherwise, that whole sub-plot could have essentially been written out. Too bad, though. That subplot of the professor and his media team could have actually been fleshed out to be an intricate part of the plot. That’s pretty well it. This is a movie that is unapologetic in that it is fully aware of what it is: a “Michael Bay”-ish disaster sci-fi movie. I am pretty sure that the cities of L.A. and San Fran should pretty well be completely leveled after the earthquakes. The movie is released during an appropriate time because it falls after Tomorrowland and before Jurassic World. It also typifies the summer movie season because it is a great popcorn movie that most anyone will enjoy. If you liked this or other reviews of mine, please FOLLOW or SUBSCRIBE to this blog.